120V/5200BTU /1500W heater w/fan and adjustable flame brightness. Fixed glass front. Side brick detail. Simply plugs into a 120V wall outlet or can be hard wired. Spectrafire® 5 flame colors. This electric fireplace has high-intensity realistic LED technology, and has a timer for up to 6 hours. 1 Year limited manufacturer’s warranty. The Belmont’s Caramel Oak finish evokes thoughts of relaxation and joy. This mission style TV stand with brushed nickel hardware features storage space with adjustable shelves and glass doors. The Belmont’s full open shelf is perfect for storing AV components, remote controls and the like. Its practical storage space combined with its cozy design make the Belmont an excellent fit for any relaxing decor. 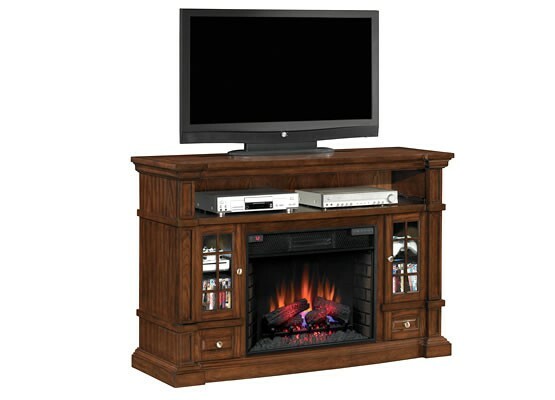 The Belmont TV stand complements a ClassicFlame 28″ 28II300GRA electric fireplace insert. Simple, hassle-free assembly with just a Phillips head screwdriver.